I am always so grateful for this time of year, giving us time to pause, take a breath, and reflect on how the past year has gone. For the Hutchinson Homestead & Learning Center, what a year it was! One of the biggest successes of the year came with the completion of an interpretation grant in May 2015. Funding through History Colorado State Historical Fund and the National Park Service Save America’s Treasures Program, and a year and a half of work with an amazing interpretation team, saw the design, fabrication and installation of interpretive displays in the Visitor Center, new signage at the site’s entrance, a brochure, website and welcome video. All of these combined made us truly ‘visitor-ready’. Since then, over 230 visitors stopped by the HH&LC to learn more about the site and take a tour of the Homestead buildings, to learn their stories and walk in the footsteps of those who have lived and worked here before. Of those guests, the majority happened to be driving by, saw the sign, and decided to stop in. 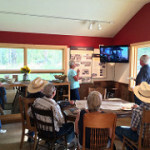 Hooray for heritage tourists and the opportunity to share such a unique place with visitors to Chaffee County! Summer at the HH&LC also resounded with the laughter of children, strains of banjo music, the braying of Delbert the Donkey, and the rustle of pasture grasses as children hiked, explored, and played during our Farmhands Summer Camp programs. Farmhands programs at the homestead weave together the cultural and agricultural history of the site, traditional homestead skills and current ranching practices. Children ages 5-12 had the opportunity to work with guest instructors including Abby Hutchinson, several fiber artists, a farrier, blacksmith, leather-worker, beekeeper, large animal vet, historians and cowboys, as well as explore the pastures, irrigation ditches, corrals and Cottonwood groves of the Hutchinson Ranch as part of their camps. In all, there were 386 student contacts through 6 distinct summer programs/ 24 program days, as well as 115 students through 3 school field trip programs this year. The success of these programs and tours are due in large part to the time and talent of our volunteers and guest instructors. Their graciousness in sharing their expertise with children and visitors are what bring the HH&LC to life. For them, we are truly grateful! Finally, 2015 saw the transition of the operations and management of the HH&LC from Salida Area Parks, Open Space and Trails (SPOT) to Guidestone. It is due to SPOT’s fundraising, care and attention, and the support of many individuals and businesses, that the HH&LC is what it is today. Guidestone is honored to be entrusted with the oversight of the homestead moving forward, and we are thrilled to help bring the HH&LC into this next phase of community engagement, events, programs and celebrations! As we dive into the New Year, we are kicking off the programming season with a Friday Enrichment Kids Quilting Series! Quilting was an important skill on a homestead, and a way to spend time indoors through chilly afternoons. Learn to piece, sew and quilt a small lap quilt in the company of friends, and take home a cozy treasure for the long winter ahead. Designed for ages 9 and up, and all experience levels, participants will join us for 6 Fridays, beginning January 15th! 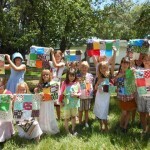 Local quilter, Jodi Poole will help provide instruction as we learn this traditional life skill. For more info and to Register, Click HERE! There are many additional programs and events being designed and planned, and we look forward to sharing all of these opportunities in the near future! From the homestead, we wish you a cozy winter, and hope you will visit us sometime in 2016!